The golf school has been selected to Golf Magazine's prestigious list of the Top 25 Golf Schools in America! Situated in Charlotte, North Carolina, the school uses their golf launch monitor as a club fitting tool and a training aid. Dana Rader Golf School has introduced FlightScope's top of the line X2, the latest and most advanced 3D launch monitor FlightScope has to offer. Given its portability and performance, the new X2 will allow Dana Rader Golf School to serve its students more easily to club fit, track distances for each club from start-to-finish, and identify the correct path of the swing which cannot be seen on video. 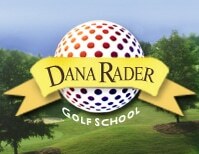 "Adding FlightScope to our already state-of-the-art arsenal of golf training equipment and technology will give us data that is much more accurate than video, allowing us to provide a blueprint for better ball striking," said Dana Rader, Founder and Owner of Dana Rader Golf School. "With the technologies of FlightScope, we get extremely accurate ball flight and club delivery data which proves to be a valuable tool for golf instruction, swing analysis, ball and club fitting, and club recommendations."